As the release of the Vorkosigan Saga Sourcebook and Roleplaying Game draws near, we prepare with another batch of previews. These three answer the question, "What if I don't know the worlds of Miles as well as I'd like?" This book has you covered, my friend. A section on the history of the galaxy is to be expected, but the wealth of information on each planet -- and the number of planets covered -- may take you by surprise. Take a look at the entry for Komarr, the crossroads for merchants from dozens of planets, or Sergyar, the frontier world with a rather famous governor. 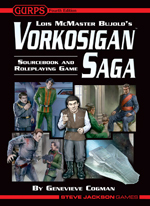 Vorkosigan Saga hits our warehouse the end of the month, and should start appearing on the shelves of your friendly local game store a few weeks after. If you simply can't wait, the book is also available as a PDF from e23.